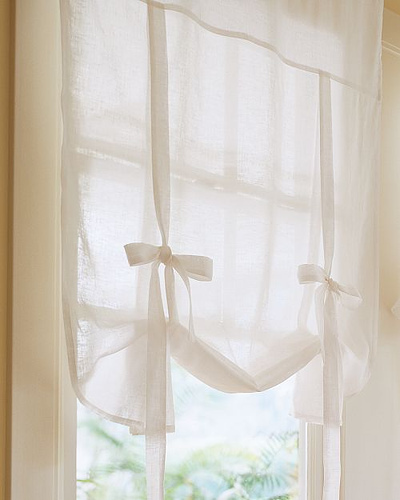 I absolutely love Pottery Barn's sheer linen drape shades. They are in my living room, dining room and my daughter's room (and I made a DIY version for my son's room). Pottery Barn seems to carry them sporadically, but I've seen them on eBay (which is where I bought all of mine). I've also seen knock-offs at Target. They are just perfect for a room that does not need privacy and needs lots of light but also needs some kind of window treatment. Love. So, naturally, when it came time to figure out a window treatment for my mother-in-law's dining room's big bay window, my first thought was to use a Pottery Barn drape shade. Her window looks out onto the backyard, so there is no need for privacy. Once we removed the old valence over the window, she really liked how much light was streaming through that window, so we knew we needed something sheer but that would also warm up the space and finish it off a bit. There were more than a few wrinkles: her windows are a non-standard size and Pottery Barn does not have the drape shades available right now. I took a close look at my own drape shades and knew I could DIY them. And I did! It was very simple. First, I measured the windows. She had two skinny windows and one larger one. I bought three tension rods at Target (totaling about $10 total). Then, I ordered 2 yards of faux white linen from fabric.com, which was on sale for about $2.50 per yard. Score! Cheap! Yay! I grabbed some more no sew seam tape with permanent hold. Finally, for the ribbon ties, I picked up some white grosgrain ribbon from Wal-Mart for about $5 total. Sum total of supplies was $25. For three curtains! Once I had my supplies, I got out my iron and ironing board and got ready. First step: cut your curtains. I had measured the width of each window and decided to add an inch to this measurement, to account for the "hem" on the side when I ironed the seam. [Note: I now recommend adding two inches. I cut it a little too close for comfort this time]. So I used my yardstick to cut the three panels. Second step: create your hem on the sides the the bottom. This is very easy to do: simply place your seam tape in between your layers of fabric and iron. I've used a bunch of different brands of seam tape, so it's best to follow the instructions on the back, as they are all a little different. Third step: create your pole pocket. This is where you hang the curtain from. I find that a two-inch gap is more than sufficient. I measured and folded the top part over, which created a two-inch gap at the top, where I could insert the tension rods. It's important to go slowly here so that your top hem is straight and even. You could even put the rod in the pocket as you iron. Repeat steps 1-3 with each panel. This takes awhile. It took me about an hour to do all three curtains. Fourth step: hang your curtains. Don't they look good? What do you think? Ready to try something similar in your own place? You know we'd love to help if you want it! PPSS: Yippie!! We've been featured again on Copy Cat Crafts for this project. Click here to see it. And if you want to see the other project we had featured back in Fall 2010, click here. Yay! Looks great! I'd like to attempt to make one for my laundry room. Do it! It's so easy. The bulk of the expense for me was the tension rods! 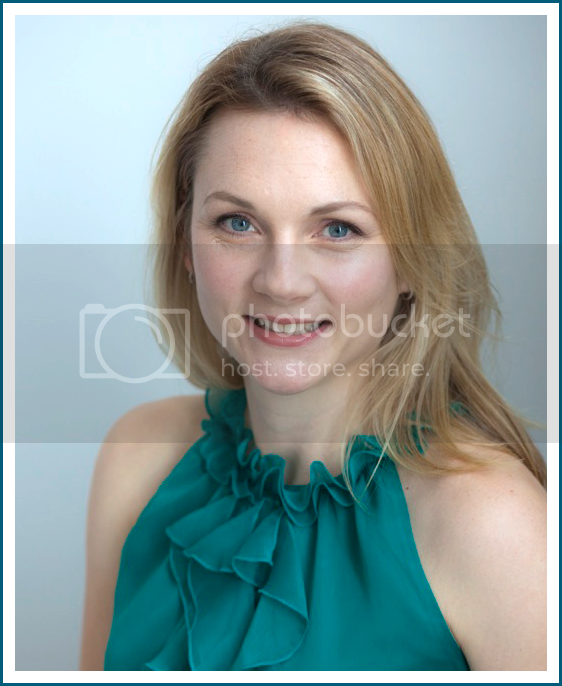 I saw them in person on Satruday, they look fantastic in the room, nice work Shanna! I LOVE this site! And, I may finally replace my most hated curtains in our least used room. Thanks, Staci! If you tackle your curtains, send them our way! We love to share our readers' projects! Um, I can't believe you know how to do this stuff. AMAZING! What a very chic and super-cool look! Great job!! I love these! Do you think that it would work to use a heavier fabric and maybe sew on some black-out material to the back? Exactly how did you find the fabric? The website said nothing matched "faus white linen", and all the linen fabric I found was $13/yd. I just looked and the fabric I used is no longer available. It was called "linen look" and there are a few colors left on clearance for less than $2/yard but sadly no white. Hope this helps and thanks for stopping by! like an adjustable curtain made like this? Hi Shanna one question: did you tie the ribbon on both sides of drape to tie at the bottom? And how long did you leave the ribbon at the bottom of drape? Thank you! Hi there! I have done a couple of things with the ribbon: bows/knots or staples. Most of the time, I do bows or knots. I cut the ribbon really long (far longer than necessary) so that it hangs well below the windowsill. I would rather have too much than not enough. Then I play around with the length on the actual window. I did a simple knot on my mother in law's drape shades because I liked the sweet simplicity. But I have done bows on other windows. Now, to take an easier way out, you don't need to tie the ribbon at all. For my playroom windows, I simply stapled the ribbon together and just hid those staples at the top of the window. It does the trick and was much faster because I did not have to play around with tying the ribbon to look good. I hope this helps! Feel free to shoot me an email if you have questions - shanna@swoonstylehome.com ! Also, we'd loooove to feature your own curtains here on the blog if you're interested! Thanks for the comment! 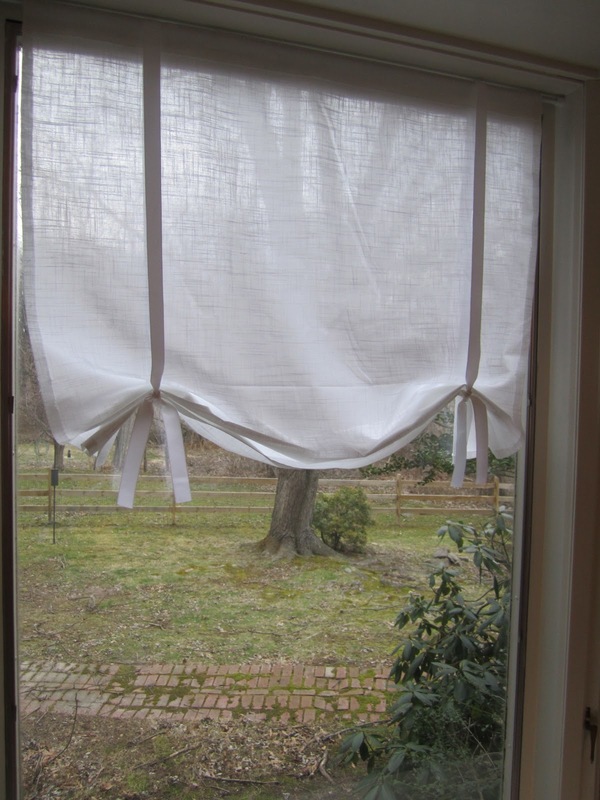 Hi - I know this is an older post, but do you just drape the ribbon over the top of the curtain and the tension rod? Judi/Knox,IN - what you're looking for is a pattern for roman shades. They sew small plastic white rings in columns down the back side of the curtain/shade (looks just like this one, except goes all the way down to the bottom of the window), and then run strings through the rings and then they all meet on one side and are knotted together so they can be pulled to raise or lower the shade. 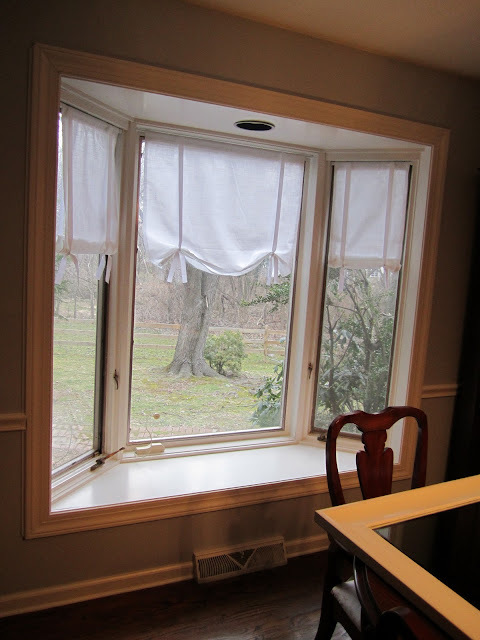 The curtain is usually stapled to a board and mounted to the top of the window, inside. Google 'how to make roman shades', and you'll probably see a pattern. Awesome! This definatly is going in my 'to do' box. Brilliant, just what I was wanting, explained simply. Ta ever so. This is so awesome!!! I absolutely love them!!!! Just saw this on Pinterest, and I love it! Exactly what I need for my bedroom. This is a great stuff which i have got here thanks a lot. Great tutorial. Get this look for even less with these discount drapery fabrics: http://ow.ly/BfjNw. Great details here, better yet to discover out your blog which is fantastic. Nicely done! Thank you Shanna for this post. I have since made these curtains for my kitchen window, with the same fabric you used. They are darling. you can check lucky patcher .apk here. That's very nice blog, thanks for sharing it. you are so tallest, I like the way you sewed and decorated your house. Keep it up!